The Macmillan Alice Colouring Book is newly published by Macmillan Publishing and is part of my personal collection. 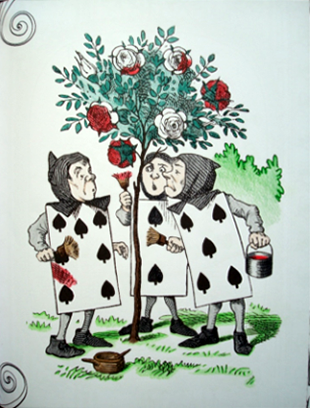 It was released to celebrate 150 years since Alice’s Adventures in Wonderland was originally published, and includes the original illustrations by Sir John Tenniel. This book is beautiful and every Alice fan’s dream. 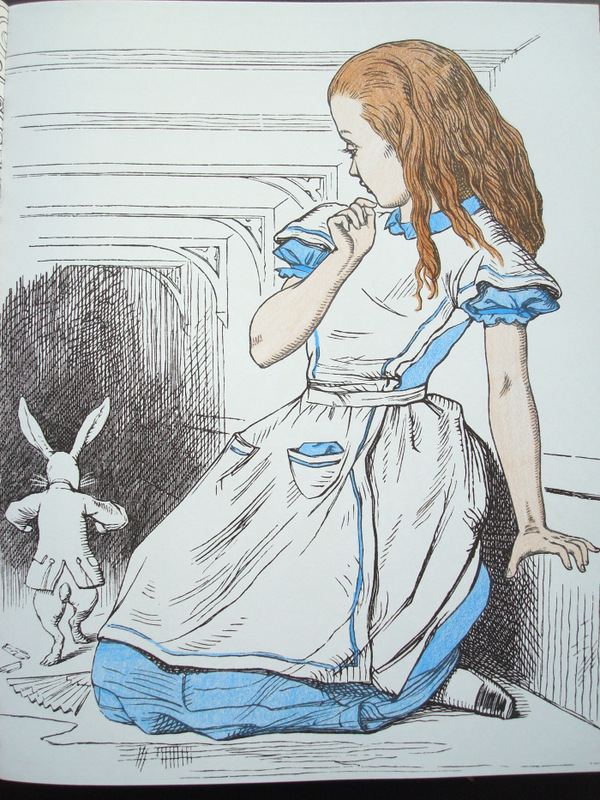 Lewis Caroll’s two tales of Alice’s adventures have been my favourite stories for as long as I can remember. Whenever I watch any of the film adaptations, read the books or quotes, or see illustrations of her story, I’m transported back to my childhood. I am reminded of the wonder I used to feel. I was very worried that this book might be disappointing, because I’m such a huge fan of Alice and her world. As soon as I opened the cover, however, I fell down the rabbit hole and was instantly traveling through Wonderland! This book is A4, softback and printed double-sided with mostly double-page spreads. 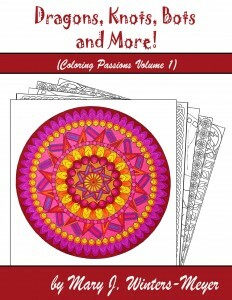 The designs either consist of a double-page image or an image alongside a quote from the book, and occasionally a spread of patterns or repeated illustrations. The spine is glue-bound and there is no border around the images so a little is lost into the spine on each page. 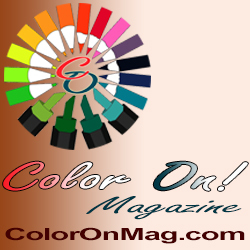 The line thickness varies throughout from very thin to medium thickness depending on how much the original image has been enlarged. You certainly don’t need perfect vision or fine motor control, though, to be able to get huge benefits from this book. One huge difference between this book and all of the other adult colouring books I own and have seen is that most of the images, certainly all of the original Tenniel ones, are not just outlines, they contain considerable amounts of black cross-hatching. The reason for this is because the illustrations were originally printed in black and white, and Tenniel needed to be able to indicate light and shade. I know this won’t be everyone’s cup of tea, but bear in mind that these illustrations were created 150 years ago and were not created for the purpose of colouring but rather to illustrate the story. The texture that has been added is actually really useful in showing which areas are light and dark. 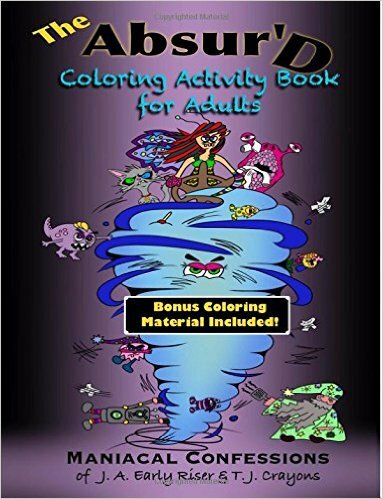 This can really aid colouring, especially for newbies. This picture I coloured above was really easy to colour because the cross-hatched parts of the roses were clearly meant to be the parts that had been painted red by the cards and the bits without were still the original white. Some of the images, especially those of the Cheshire Cat are very heavily shaded. You’ll have to decide whether you like this effect or not. This book contains 96 pages and the paper is almost white and smooth with very little tooth. I didn’t find it difficult to build up a few layers when colouring with my Polychromos pencils. The paper is medium thickness and doesn’t bleed when using water-based pens, but it does shadow a little. So you should be careful when using pens — don’t hold them in one place for long or over-colour or it will bleed and you could ruin the reverse image. A few of the pictures have black backgrounds which is a nice touch — it really makes your colours stand out and adds to the quirkiness of the book. I found it very in keeping with Alice’s Wonderland tales. One major thing I found very strange and a little disappointing is that the images are presented in a random order. They don’t tell the story in its original order. I personally think this is a real shame. I’m not sure what the reason behind this was, but please don’t let it put you off. The illustrations are really beautiful and the book is certainly worth having! All of the iconic characters are pictured within: the Cheshire Cat and his famous grin; the White Rabbit who is perpetually concerned at being late; the Mad Hatter, March Hare and Dormouse all attending their tea party; the Duchess and Queen and King of Hearts all competing in the bizarre croquet match; and finally Alice herself meeting everyone and everything, questioning reality — indeed her very being — journeying through the curiouser and curiouser world of Wonderland. This book truly draws you in and allows you to escape from the real world and into Wonderland where nothing is quite as it seems and everything you know to be right and true, isn’t quite anymore. This book offers true escapism. If you loved Alice as a child, it will take you back to your childhood where you first heard Alice’s story and became intrigued by it. These illustrations are wrapped in so much history and are so delicately drawn by the highly talented Sir John Tenniel. All they’re missing is the colour that you can easily add to bring them to life and create a Wonderland of your own.